Vermillion Players, Inc., an amateur theatre troupe based in Pontiac, IL and which relies upon the talent throughout all of Livingston County, has been providing quality live theatre to Pontiac and surrounding communities for 50 seasons. Founded in 1965, we stage musicals, comedies, melodramas, farces, revues, and serious drama in the summer of each year. Our home base of stage production is the Chautauqua Park Pavilion in Pontiac, IL, and every summer the pavilion comes alive with the sounds of music and laughter as performers delight audiences of all ages. 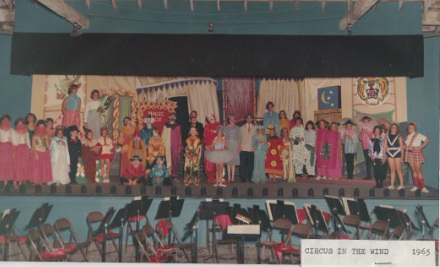 Originating as a children's theatre, Vermillion Players was formed with the idea that the young in the area would have an opportunity outside of their schools to experience and participate in live theatre. The troupe has evolved into a diverse group dedicated to bringing area talent together both on stage and behind the scenes. Vermillion Players is governed by a Board of Directors and relies essentially on volunteers and monetary donations from the business and private sector of Pontiac and area communities. Volunteers are always welcome to participate in whatever way they can lend their skills and abilities. Donations are also welcome at any time. We are a 501(c)(3) Non-Profit Organization and contributions are tax deductible to the extent allowed by law. Vermillion Players, Inc. is a proud member of the American Association of Community Theatre, Illinois Theatre Association, and the Pontiac Area Chamber of Commerce.